Northwest composer Christopher Lee Fraley focuses on telling stories through music, writing music that is tuneful and accessible while preserving those aspects that make classical music so engaging: interesting counterpoint, rich harmonies, expressive structures, varied color palette, and careful craftsmanship. Fraley’s compositions have been premiered by the Byrd Ensemble, Cascadian Chorale, Vox16, Master Chorus Eastside, and the Pittsburgh Civic Orchestra. 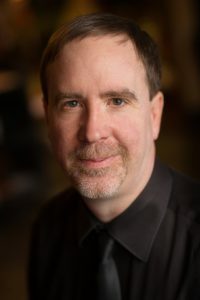 He continues to write works for chorus, chamber ensembles, and orchestra, and his credits include over twenty choral settings, two operettas, string quartets, eight tone poems, a symphony, and pieces for piano and various chamber ensembles. Chris also sings tenor with the Cascadian Chorale, occasionally plays cello, and loves studying how musical sounds combine.